I used to think guacamole was solely a dip. A luscious, green, creamy dip to scoop a salty nacho into or to be added to a hungry looking enchilada. How wrong I was! By chance I discovered that guacamole is very versatile and can be spread on toast for a satisfying breakfast, can be used as a creamy addition to a rice dish, used as a sandwich filling with crunchy cos leaves or used in the traditional manner as a dip. Most people have their own way to produce the perfect guacamole, add red onion or not, maybe some chopped tomatoes, chillies, or coriander, there are numerous possibilities. Here I’m keeping it simple but deliciously moreish. . . . 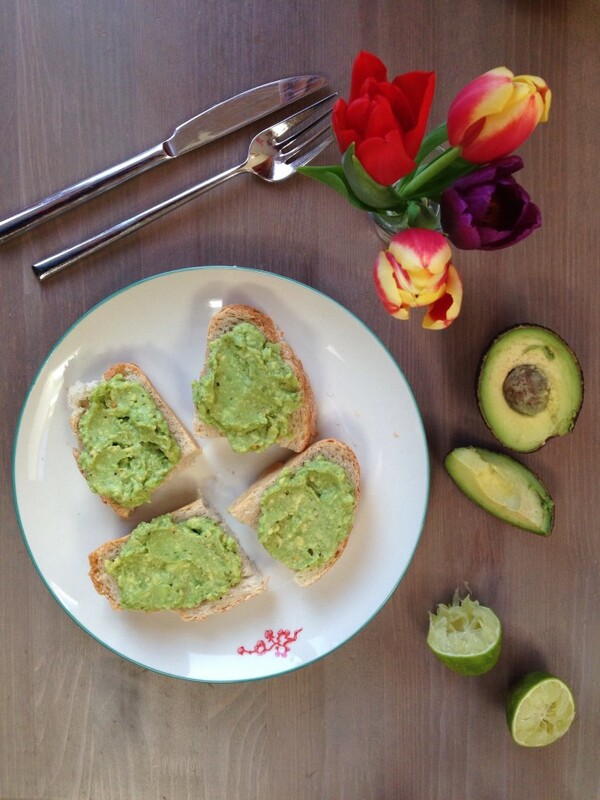 Mix the avocado, garlic, lime juice and salt & pepper together in a bowl and your done! Trans fats are man made unnatural fats and should be avoided. Hydrogen atoms are added to a fat through a process which alters its natural chemical makeup in order to give it a longer shelf life. You’ll find trans fats in foods like pre packaged cookies, pastries and margarine. Saturated fats are mainly found in meat and dairy products. These fats can increase ‘bad cholesterol’ AKA low density lipoprotein or LDL. Cholesterol can raise blood pressure and lead to hardening of arteries among other conditions. Saturated fats are best limited in your diet. Unsaturated fats are found mainly in plant sources. They have a range of health benefits as they help increase good cholesterol AKA high density lipoprotein HDL and decrease LDL thereby reducing cholesterol. These fats are further divided in monounsaturated and polyunsaturated depending on their chemical makeup. Omega fats, 3 and 6 are examples of polyunsaturated fats and are essential in our diet as we can’t make these fatty acids. Avocados are rich in oleic acid which is an omega 9 fat. These are monounsaturated fats. Oleic acid is also found in olives and olive oil. Since oleic acid comes under the unsaturated fats category its health benefits include reducing LDL and increasing HDL. It’s also has anti inflammatory properties which helps reduce inflammatory conditions in the body like arthritis. Avocados also contain vitamin E which benefits the skin, fibre and antioxidants. One Response to Anytime Guacamole!